The United States Army turned a ripe 243 years old today, a festive occasion made all the more exceptional because of another special designation occurring on the same day. No, not Flag Day — National Bourbon Day, one of the many nectars as critical to the military’s sustained success as 5.56 ammunition and marriage annulments. Not all whiskey, of course, is bourbon, but those variants produced in America happen to be, and since we’ve decided to delve into whiskey’s deep-seated relationship with American patriots, the adjacent existence of dark drink and duty to country must be recognized. When the Revolutionary War cut off the trade of molasses and inspired disdain toward all things English, the old drink of choice — rum — was abandoned. Whiskey quickly ascended to the throne of American spirits and subsequently entered the hearts of patriots everywhere. The word “whiskey” comes from the original Gaelic term, “uisce beathadh,” which translates to “water of life.” Scour the annals of U.S. military history and evidence of whiskey-induced intoxication is littered throughout — it is the military’s life water. Consider that Congress authorized an actual whiskey ration on Nov. 4, 1775, for Gen. George Washington’s Continental Army, or that exemplary actions on the battlefield were rewarded with even more drunkenness. In 1794, an uprising of distillers and farmers in Pennsylvania threatened full revolution because of a whiskey tax enacted by the government. This was, of course, appropriately coined the Whiskey Rebellion. September 14, 1803, near Marietta. Set out this morning at 11 oClock [sic] was prevented setting out earlyer [sic] in consequence of two of my men getting drunk and absenting themselves. I finally found them and had them brought on board, so drunk that they were unable to help themselves. Today, just the task of getting your still-smashed roommate to get dressed for morning formation can be as difficult as explaining the theory of relativity to your dog. But imagine making a round-trip journey on foot, by boat and horseback spanning a total of about 8,000 miles — from the St. Louis-area to the Pacific coast in Oregon and back — while most of your party is continuously hammered. And don’t forget that Lewis was also shot in the leg by a member of his own party during a hunt. Decades later during the Civil War, the drink would be used by medics to treat patients, employed to quell the nerves of soldiers and, most commonly, heavily consumed during breaks in the chaos. Just look at the cartoon below from an 1862 issue of Harper’s Weekly. 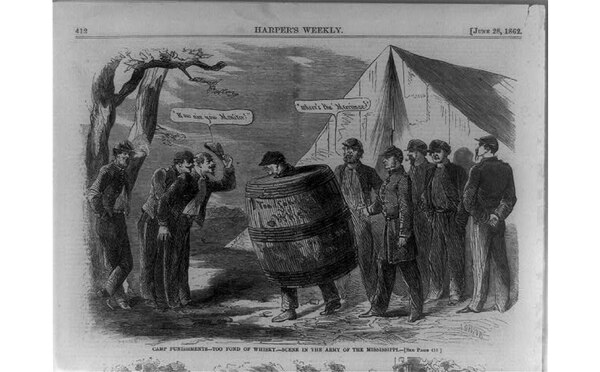 Some poor sap — probably named Jedediah or Thaddeus or something 1860-ish — who inevitably had too much bark juice is given the dubious honor of donning the 1800s-era drunk tank — an actual whiskey barrel — while his friends stand around taunting him. Imagine enduring a brutal hangover and fighting a war while wearing a barrel. Not all heroes wear capes. President Abraham Lincoln, too, developed an appreciation for the drink while valuing the military tactics of Union Gen. Ulysses S. Grant, a man of renowned drinking ability. In this excerpt from a October 1863 New York Times article, Lincoln was questioned about Grant’s recurrent inebriation. Fast forward to today, and whiskey remains the preeminent alcohol of choice for Americans, especially among those serving in the armed forces. 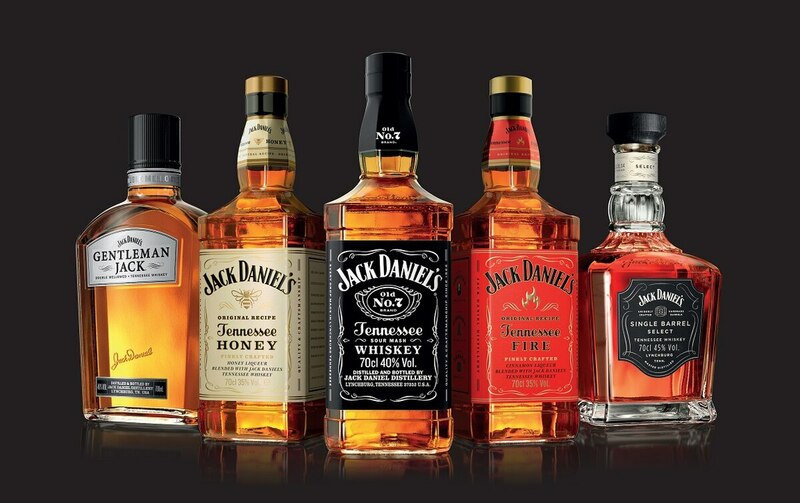 In fact, no U.S. demographic purchases more Jack Daniel’s “By The Barrel,” a bottling program started in 1997, than the military. So raise your shot glass to the Army today for number 243, or make yourself a cocktail, and take pride in the interminable impairment of your forefathers. Whiskey is, after all, the water of life, beating through the very veins of military personnel everywhere. Don’t let that guy wearing boat shoes, salmon-colored pants and a navy blue polo convince you otherwise — no matter how much he wants to brag about that new craft IPA only nine people have ever heard of.